Firefighters walk through a finished section of a fuel break line in the area of the Burro Fire. The Burro Fire continued to lie down Friday after two days of rain in the San Juan Mountains. Public information officer Kathy Russell said the fire remains at 4,593 acres with minimal activity after afternoon rains gave the area “a good soaking” on Thursday and Friday. On Saturday she said firefighters will continue to clear containment lines of any possible fuel sources, while the crews that have reached their 21-day limit prepare to demobilize. Despite its reduced movement, the fire will likely continue to smolder for a long time. The weather has been favorable for firefighting efforts ever since temperatures started cooling down earlier this week, Russell said. The National Weather Service predicted more afternoon showers and thunderstorms on Saturday and Sunday, with temperatures in the low 70s. Although both Thursday and Friday’s showers came with lightning, Russell said it doesn’t seem to have caused any more fire activity. Firefighters always leave exposed places “at the first sign of lighting,” according to a Saturday morning press release. Crews have finished constructing a contingency line down to Colorado Highway 145, and the San Juan Hotshots who spearheaded that effort have left the scene, Russell said. Out of the remaining personnel, several planned to spend Saturday removing firefighting equipment from the area and bringing it to the U.S. Forest Service district office in Dolores. According to the release, all equipment must be inventoried, cleaned and shipped to the Rocky Mountain Interagency Support Cache, which supplies wildland firefighting efforts across the West. On Saturday, there were about 45 firefighters working on the Burro Fire, but Russell said several personnel have completed their 21-day assignment and will be gone by Sunday. Members of the interagency incident management team are required to take some time off after three weeks at a fire. Other personnel, including the two new crews that arrived this week, planned to continue clearing and widening containment lines. Although Russell said firefighters don’t expect the fire to grow as long as the rain continues, it remains officially at 40 percent containment. “Professional firefighters have high standards for what is considered containment,” she said. Right now firefighters are working to make their existing containment lines as strong as possible in case the dry weather returns. Infrared mapping flights have ceased for the time being because of the fire’s lack of activity and the need for aerial firefighting resources elsewhere. Russell said that even though the fire is laying low for now, it’s not dead yet. “These kinds of big fires tend to smolder for a very long time,” she said. The rain hasn’t driven away the drought or heightened fire danger in Montezuma County. Stage 2 fire restrictions remain in effect throughout the San Juan National Forest. 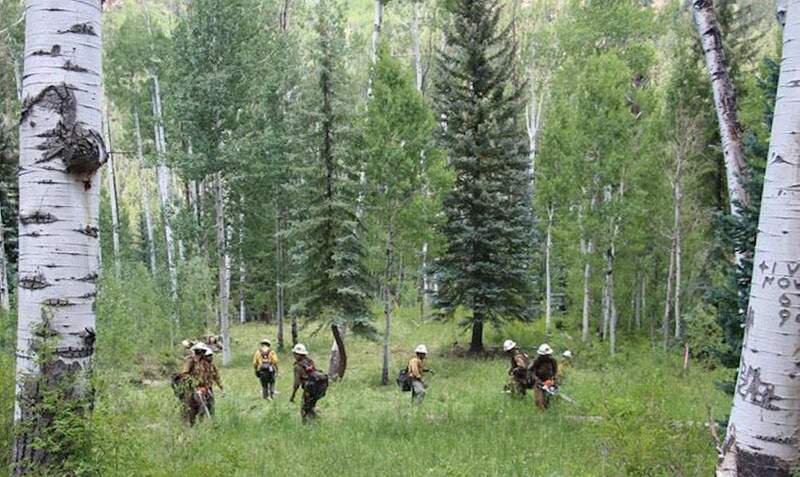 The Hermosa Creek Wilderness and the Colorado Trail between Molas Pass and Junction Creek are still closed, and Russell said she doesn’t know when they will reopen.